So the next thing I’m going to do is track down an old telephone. I’m heartily sick of my cordless and the many promises its failed to live up to – portability, user-friendliness… The ring is hideous. The sound is woeful. And its using electricity! What a wasteful expense for something so, well, disappointing. I want to go back to one of these. Red is an accent colour I want to use in my living room/kitchen which goes really well with our gorgeous teal/turquoise couch (the colour changes in different lights. Its awesome.). Once I find one that works, I’ll paint it, a-la an episode of Spaced (where Brian has his art installation), one of my all time favourite TV shows. I’ll keep you all posted when this wee ambition is realised! 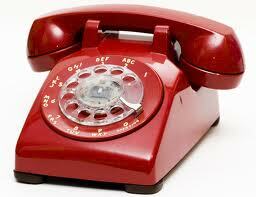 Does anyone still use of of these phones for their landline? I’d love to know!